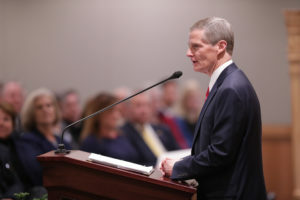 Elder David A. Bednar of the Quorum of the Twelve Apostles for The Church of Jesus Christ of Latter-day Saints spoke about being grateful for those who came before at the dedication of BYU’s new Engineering Building on Tuesday, Dec. 4. 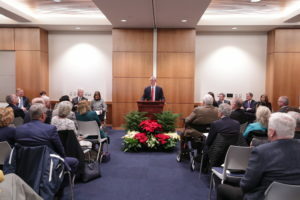 The newest building on BYU’s campus is “a remarkable facility, the result of a lot of planning and a lot of generous donations,” according to BYU President Kevin J Worthen. The building’s construction was possible with the help of $85 million, 100 percent funded by more than 17,000 donors, according to the dedication program. The building took 27 months to construct and has been operational for three months. It has five floors and is 180,000 square feet total, while the engineering research laboratory has two floors and is 20,000 square feet total. A feature exclusive to the new building includes Harvey’s Cafe — named in honor of Harvey Fletcher, the first dean of the College of Engineering. 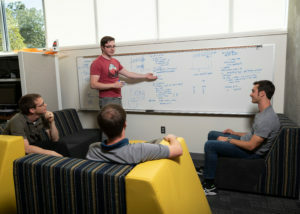 The innovation floor also includes prototyping facilities, entrepreneurship infrastructure, student club commons and project labs. 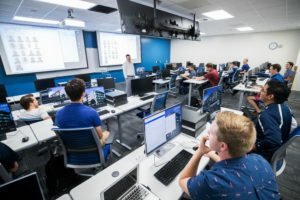 Team rooms provide students with a place for collaborative study, and an engineering research laboratory includes access to two wind tunnels, a water tunnel, engine test facilities and combustion reactors. According to the program, when the Ira A. Fulton College of Engineering opened in 1953, it had 250 students. Now approximately 65 years later, it has 4,200 students. In his dedication remarks, Elder Bednar spoke about why it is necessary to hold events like groundbreakings and dedications. He said it is to express gratitude and to celebrate a new season. He encouraged attendees to honor the past as students and faculty move into a “new season” and a new Engineering Building. He also told students that they owe it those who have come before them to be their best.